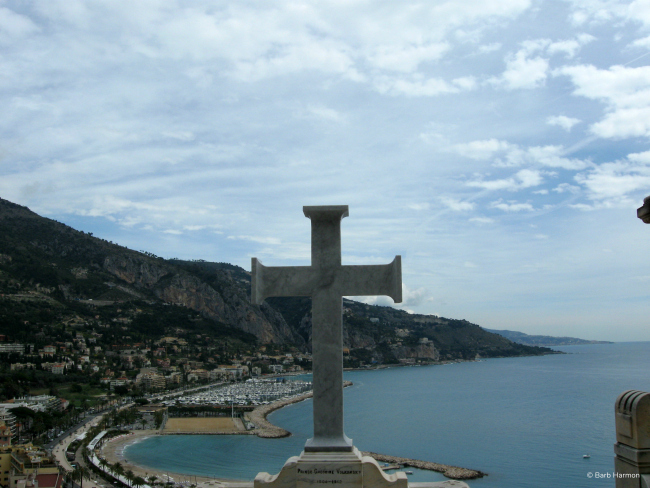 If you followed my old blog, you know that Menton, France is one of my happy places. 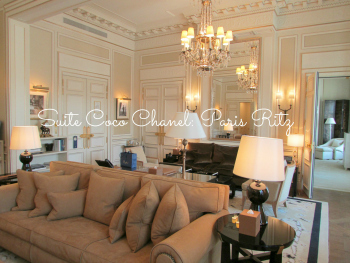 I need to rephrase that…one of our happy places since hubby has fallen in love with it as well. With its micro climate, winters are mild (although I have experienced seriously chilly days there…thank goodness for the warmth of the sun). 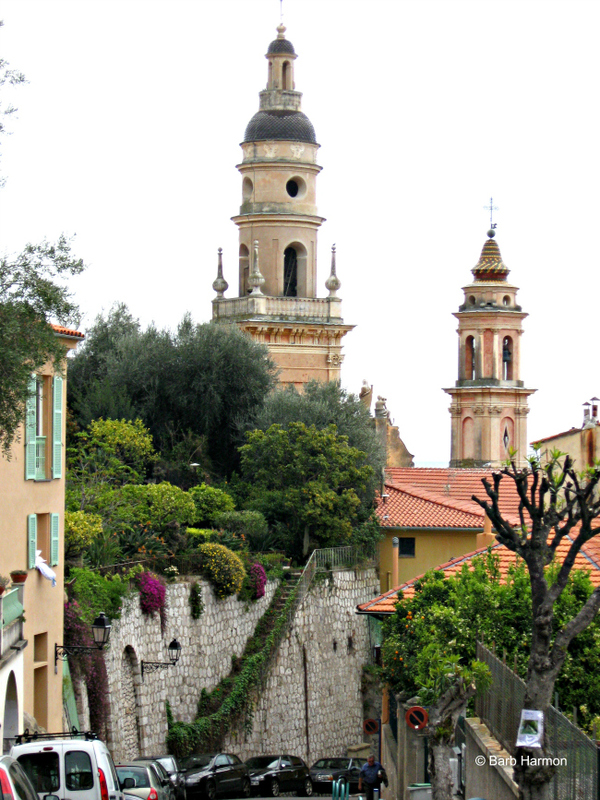 Menton has a picture-perfect medieval town, numerous Belle Epoque villas and a yearly average of 316 days of sunshine. 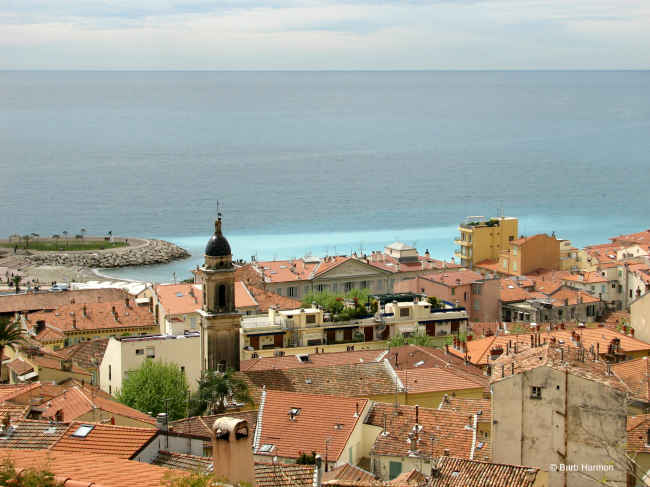 It’s easy to see why this seafront town is called The Pearl of France. The location is ideal. The Italian border is just a few minutes away. Nice, about 20 minutes, Monaco…10 minutes. 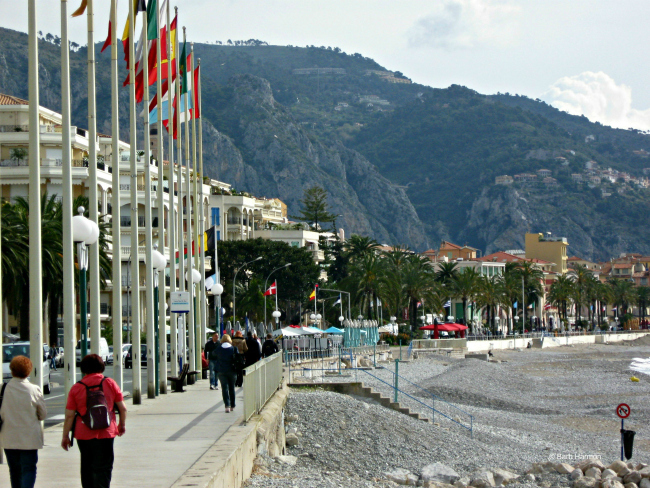 It is very easy to visit the entire Cote d’azur using Menton as a base. Menton is easy to navigate and has that lovely italian-french vibe. After writing this, I am wondering why we are moving to Mexico? 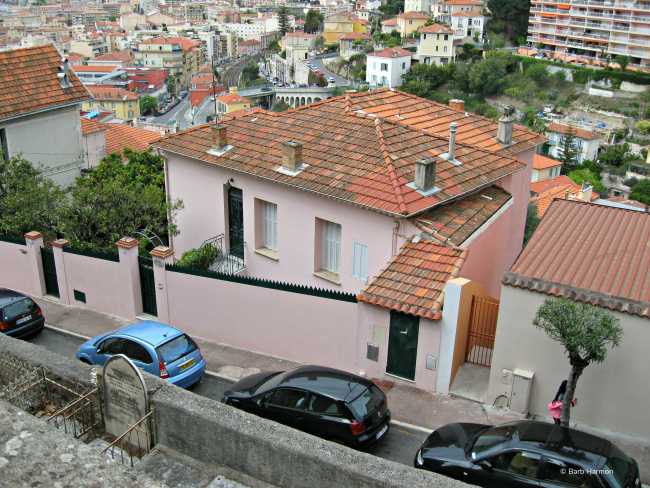 Well, that will be our home base to travel from so we’ll be able to spend more time in Menton. 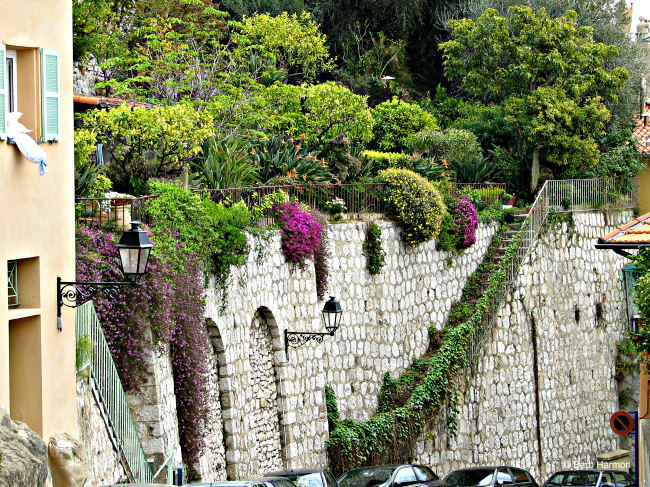 This is the Promenade du Soleil, a beautiful place for a stroll. Any time of day. Well, this post is about a hidden treasure…not exactly hidden BUT you have to make an effort to find it. You have to walk and that walk can leave you a little winded. At least I was slightly out of breath and the sweater was removed. 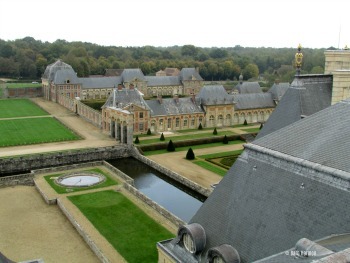 The hidden treasure is the Cemetery of The Old Chateau. There is another cemetery, Cimetiere du Trabuquet just as lovely but a farther, steeper walk. It seems a bit bizarre to be writing about a cemetery with the two year anniversary of J.W’s death quickly approaching but he liked this cemetery as well. This is the Basilica of Saint-Michel-Archange built in 1619. You walk up the hill and past this to get to the cemetery. I love the colors of the churches, all the buildings in this town actually. 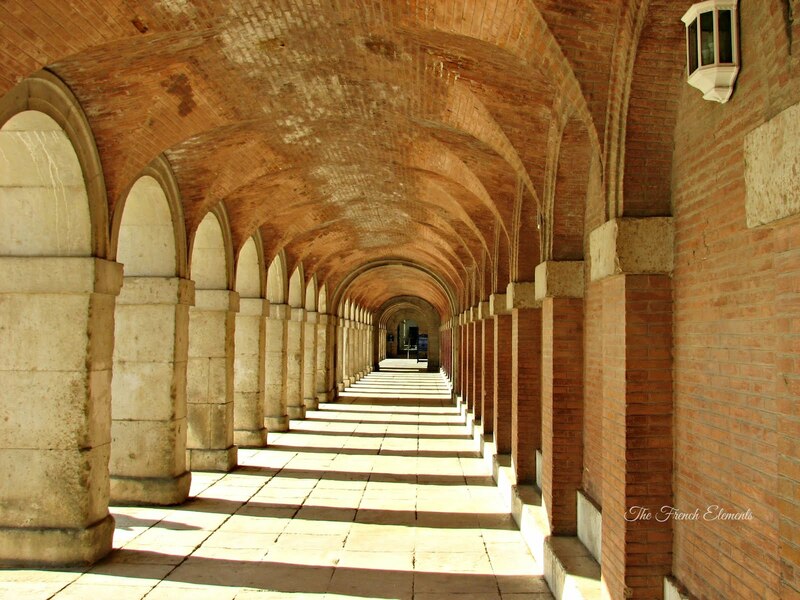 Often (on IG) I will see photo’s taken in the area and the colors have been lightened to the point they are washed out. The real deal is best…my opinion. 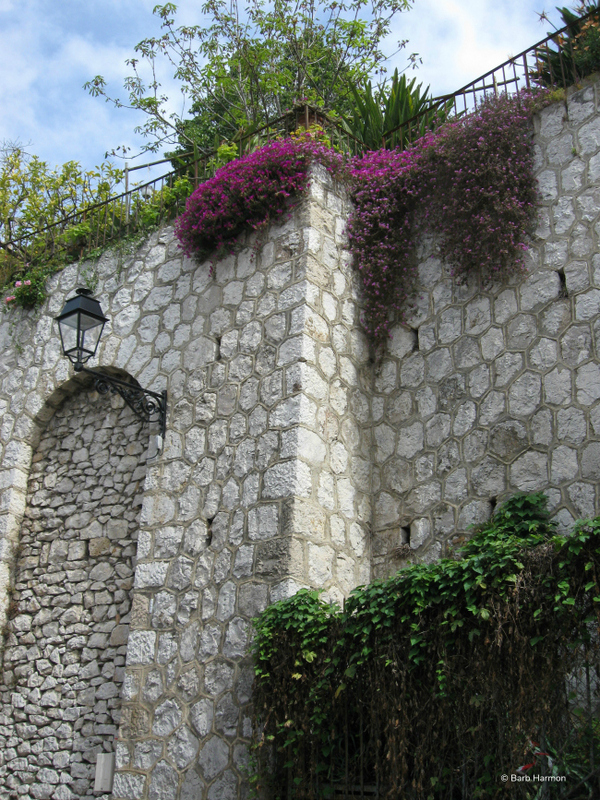 You’ll pass by this stone wall on your way up the hill. This has to be one of my favorite photo’s with the cascading flowers. Looks like it could be in Mexico. Seriously. 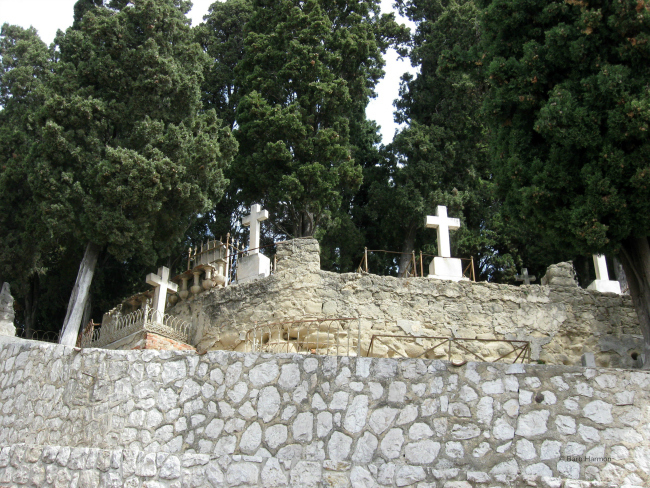 The cemetery was built where a castle from the middle ages once stood. The cemetery dates from 1808 and certainly has one of the best views in town. The panoramic view from the top of the hill is spectacular. I love the old tile roofs. And the Mediterranean Sea…I could look at that all day long. I believe the child who rests here was loved very much. His family would be proud that his grave is visited and photo’s are taken. 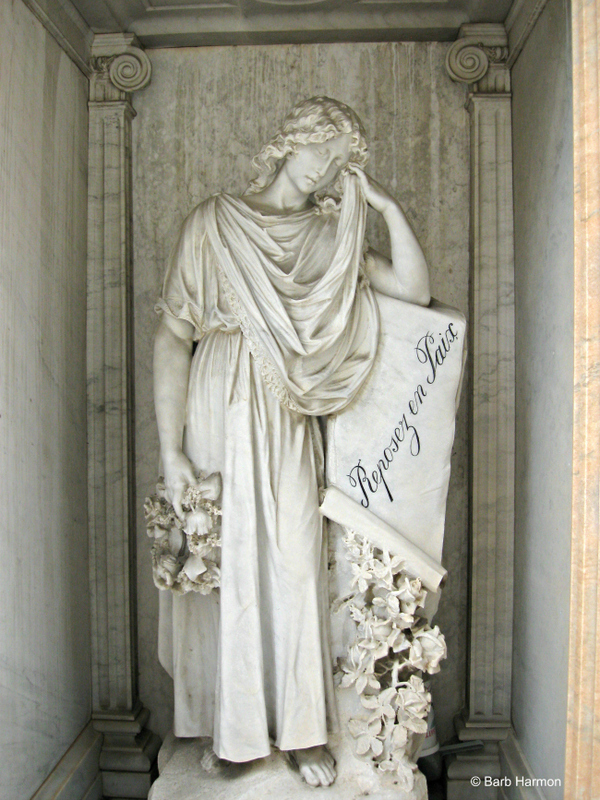 Most of the funerary sculptures are detailed and life-like. This cross in honor of Prince Gregoire Volkonsky looks as if it was plucked from Heaven and placed in this spot. Menton was the home of many wealthy Russians back in the day. 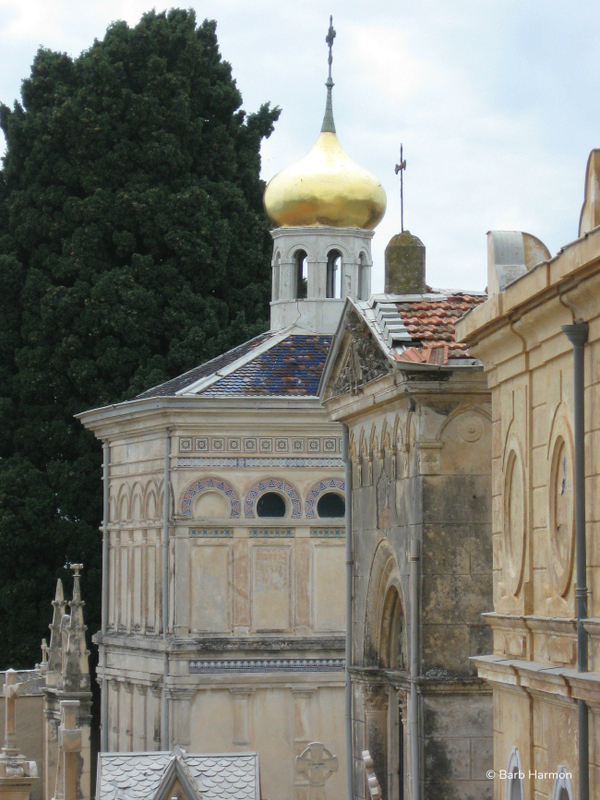 Some of the grandest mausoleums and funerary sculptures were created for Russian nobility. The gold on the dome glittered when the sun peeked out from the clouds. We begin our walk down the hill from the cemetery. Is this not stunning? I love the ivy covered stairway. 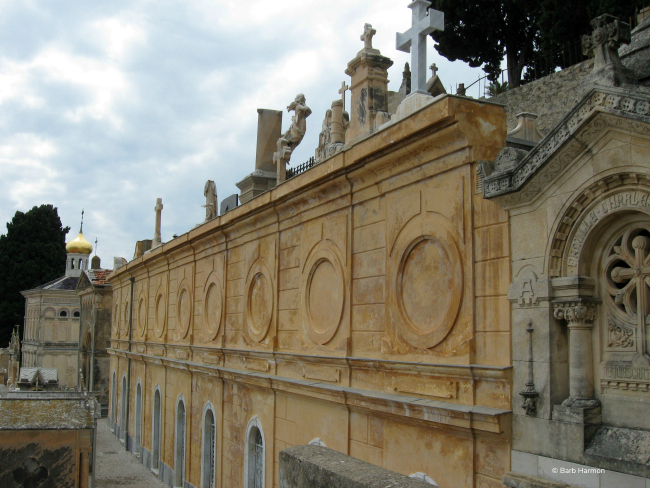 If you should have the opportunity to visit Menton, carve some time out to visit both cemeteries. Even if it is not “your thing”, you’ll be treated to the best view in town. Have a good week. Here’s to a great June. WOW, that view is worth all the climbing and walking! No words can actually describe it; CLOSER TO HEAVEN I would phrase it. What a perfect spot for a cemetery, lifting the loved ones up, closer to heaven. Love your photos and so glad you discovered this for sharing with others. This is one of our favorite hidden spots. The view is breathtaking and I love to read the plaques. So much history sitting above the town. It was always special but now it is a treasured spot to me. 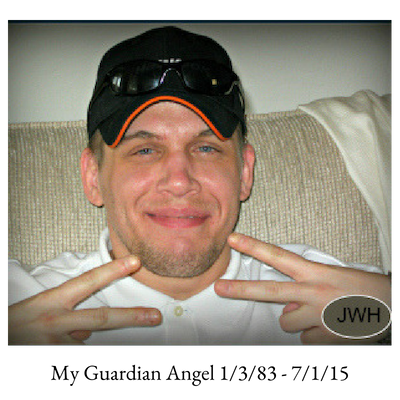 So glad that you shared this with J.W…. 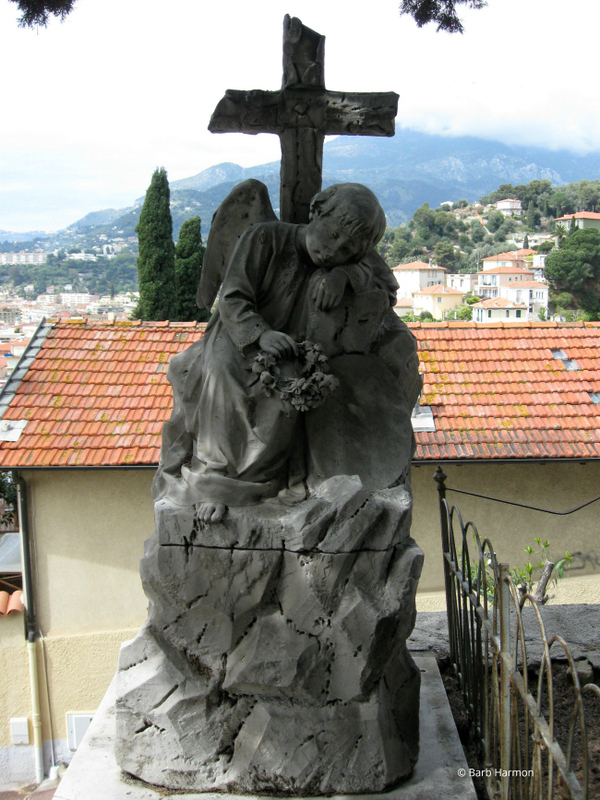 He loved Menton and this hidden gem very much. He had great taste! 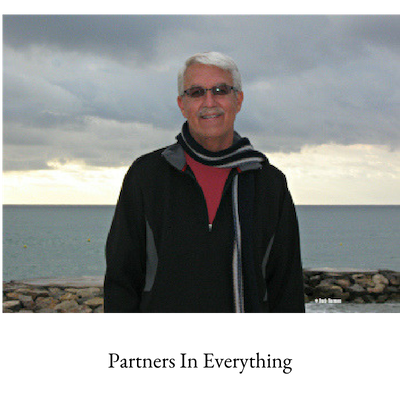 South France, one of my favorite places in the world, especially along the borders of the Mediterranean Sea. Your picture’s (almost) do it justice. But keep up the good work and … enjoy. Obviously one of my favorite places as well. 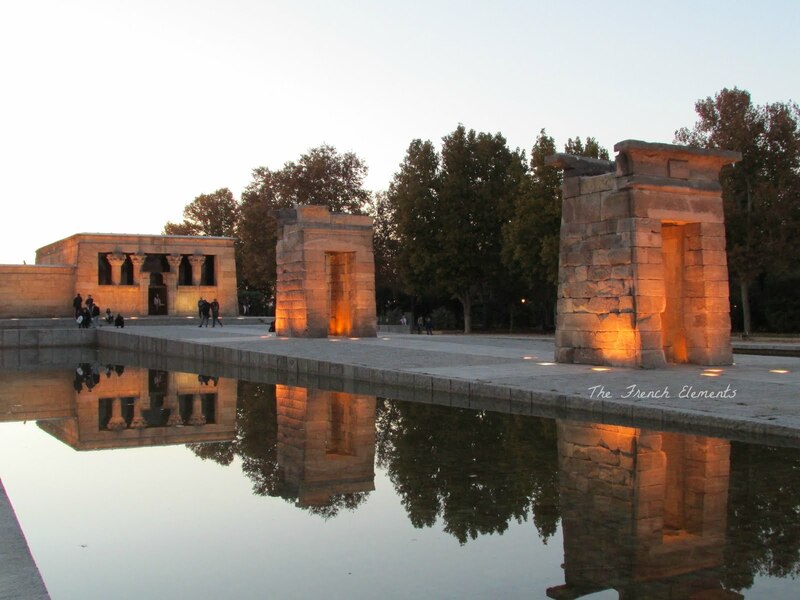 Actually, Spain on the med is pretty awesome too. No pic’s can do justice to this beautiful area. I’ve always enjoyed visiting cemeteries. It sounds quite macabre but in actuality, it’s history. Especially when you read of an infant or child’s death usually due to a simple illness that nowadays can be cured with a bout of penicillin. 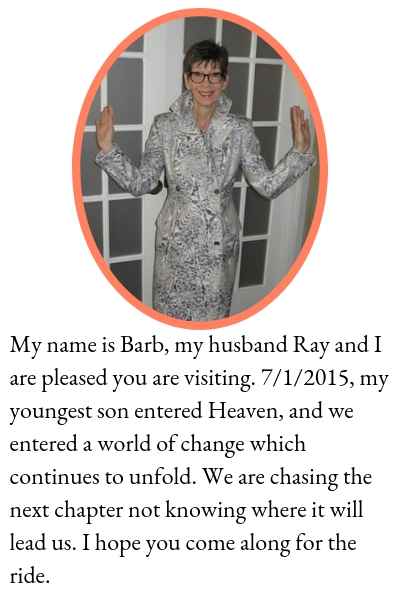 This one is so moving and gorgeous and like the above woman mentioned, a pinnacle closer to heaven in a beautiful setting. 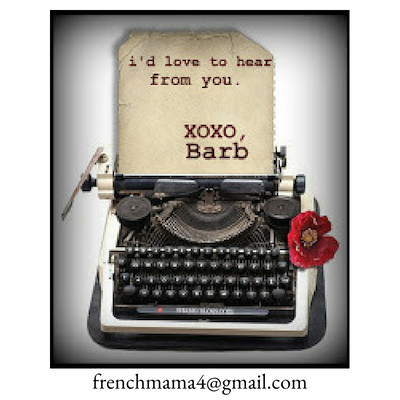 Thank you Barbara. 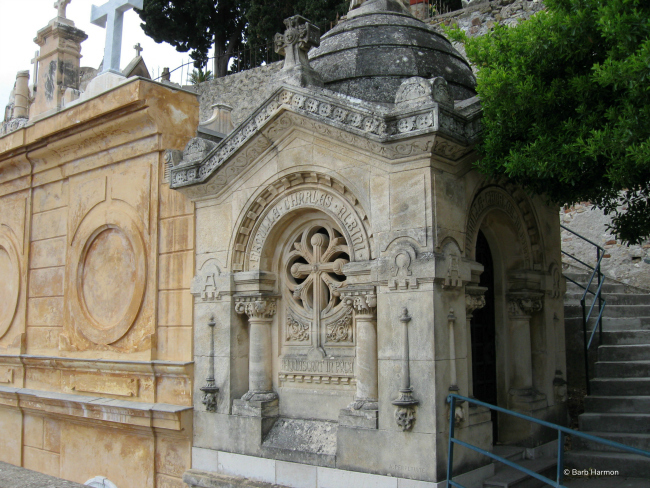 You know , I like cemeteries too…for the history. The resting places for the children always gave me a huge lump in my throat. I think about what life could have held for them…marriage…children…experience. This is one of my favorites. There is one in Sitges, Spain that is a close second. My son didn’t like the walk up to this one but truly enjoyed walking around upon arrival. Per his request, we always brought flowers for the graves that were bare. Bittersweet. Thank you for stopping by and commenting. It is very much appreciated. Just found your blog and had to stop and read your post on Menton. 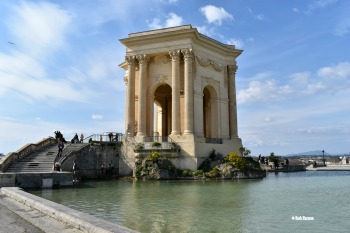 It is a great little city favored by many French seniors for their retirement. I always enjoy going there. I have many photos of the cemetery you showed – with graves from so many Russian visitors from long ago. My cousin has a house nearby. 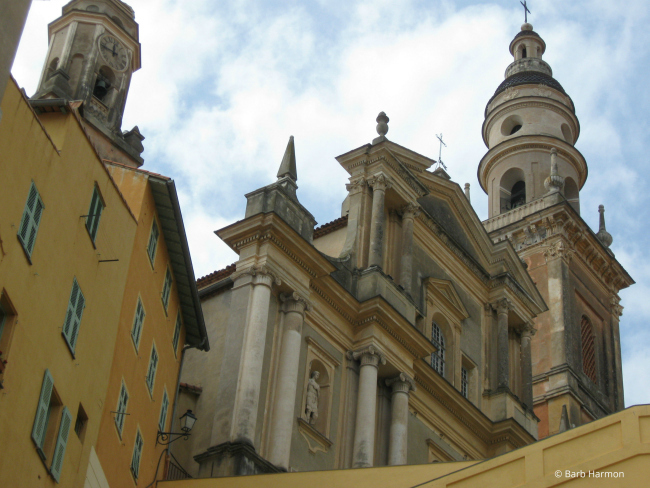 Have you been to “Fête du Citron” in Menton? It is a very popular festival, happening in February. This year the theme was Broadway et les comédies musicales. If you have not seen this festival yet I recommend it very much. Like you, we are long time fans of Menton. Such a charming city to explore. We have been to the Fete du Citron…amazing. In fact, if you click on articles at the top of my site, I had an article published in February about this magical festival. I’m looking forward to returning to one of our favorite places.